Linda took us through the process of using screens to print designs on fabric and we were all inspired by her enthusiasm and insight into all the possibilities that these techniques open up. 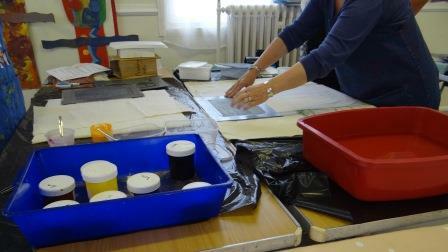 Linda encouraged us to experiment with the wide selection of screens and inks she had brought for us to use. 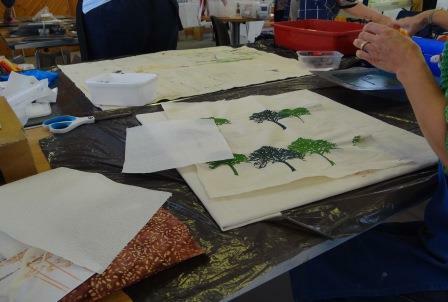 With permission to play, we over printed, combined colours, tried out discharge paste and generally had a wonderful time testing out effects on plain, patterned and batik fabrics. It was such a delight to let our imaginations run riot. A huge thank you to Linda for a wonderful textile adventure. We all learned how to make our machines work for us and relax into our work. A truly invigorating day. 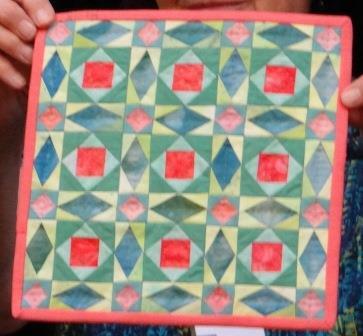 Maureen is brilliant at taking the fear out of Free Motion Quilting and before we knew it, we were tackling complex patterns with a sense of understanding and confidence. Sarah Hadfield makes the most exquisite miniature quilts and in this workshop she took us through the steps required to make a beautiful miniature Storm at Sea quilt. The workshop was based on a foundation piecing technique. 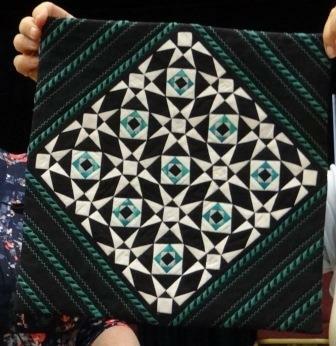 All the participants needed to do some pre-work in terms of tracing all the foundation patterns, but that done, Sarah took us through step by step and miraculously we produced the most amazing miniature quilts full of movement. A big thank you to Sarah for a brilliant day!